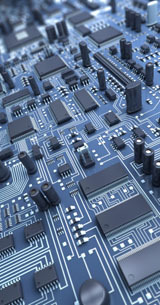 E-linking surface mount epoxies feature rapid curing, strong bonds and excellent physical properties.Avoid inadequate adhesive cure, void problems, dot slumping and inconsistent dot size with E-linking surface mount adhesives. They feature superior “green” strength to hold parts in position until cure commences. Developed for both wave soldering and reflow soldering processes these compounds are easy to dispense and have excellent electrical properties.